WITHIN SECONDS of hearing their first a capella notes, it was clear that we were in for a special performance. The clarity of the voices, the resonance of sound, the depth of emotion that filled the church—and the precision of the whole thing. The Taylor Festival Choir (TFC) is a professional chamber choir based in beautiful Charleston, SC. Founded and conducted by Robert Taylor, the choir is inspired by the lives and careers of his parents Bob and Cornelia Taylor, venerated music educators in their home state of Arkansas. 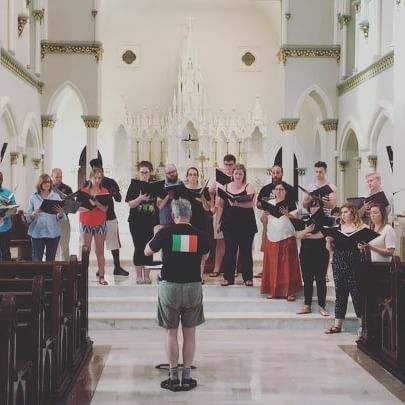 Since its inception in 2001, the Taylor Festival Choir has toured and been heard in prestigious venues and festivals throughout the United States, Ireland and the UK, and has garnered a reputation of excellence among critics and choral specialists alike. TFC has been featured in multiple American Choral Directors Association Conferences, including the 50th anniversary celebration and National Conference in 2009. TFC is part of the Taylor Music Group, and serves as the professional choir-in-residence at the College of Charleston and at the Cathedral of St. John the Baptist. It presents a full concert season in the Charleston area, and serves as the flagship ensemble for the Piccolo Spoleto Celtic Arts Series. TFC has recorded with Delos Recordings, MSR Classics, and Centaur Records. Their most recent release, featuring James MacMillan’s Mass and the world premier recording of Celtic Mass by Michael McGlynn has met with rave reviews: Musicweb International Classical Review (London) calling the TFC’s performance “choral singing at the every finest level…a very impressive performance indeed, " Sing We Now of Christmas, recorded with legendary Celtic traditional artists Liz Carroll, John Doyle and Kim Robertson, has been called “a choral feast that will linger long in your memory after you’ve heard it” (Audio Society of Atlanta). Personnel in the ensemble represent conductors, educators, performers and professionals from states throughout the United States. The Taylor Festival Choir performs the finest choral literature from all eras, medieval to modern, with particular emphasis on new music. It has collaborated with and commissioned esteemed composers such as Stephen Paulus, Trevor Weston, Brian Galante, Michael McGlynn, David Maves, Edward Hart, and Karen Marolli. TFC also performs folk music from the Celtic nations, frequently collaborating with Na Fidleiri, as well as Irish and Scottish traditional legends such as John Doyle, Liz Carroll, Kim Robertson and others. Dedicated to bringing the beauty and spiritual enrichment of choral music to as wide an audience as possible, the Taylor Festival Choir tours frequently, and performs outreach concerts in schools and churches throughout South Carolina and surrounding states.